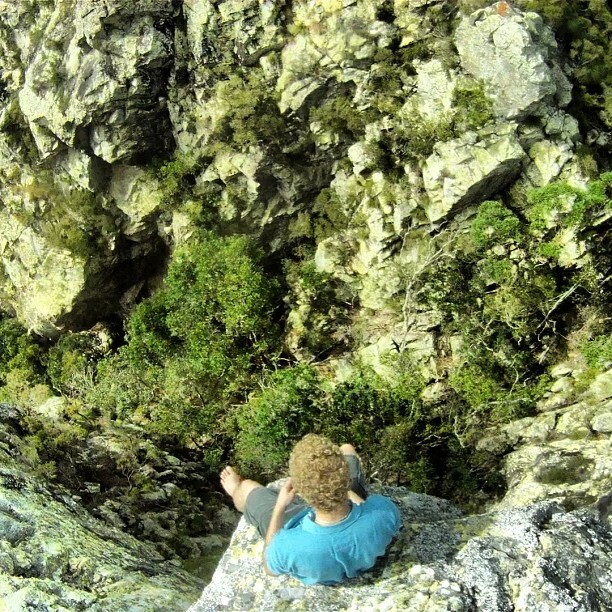 Time - Frederick Peak is a half-day return hike for the fit & experienced bushwalker with good navigational skills. 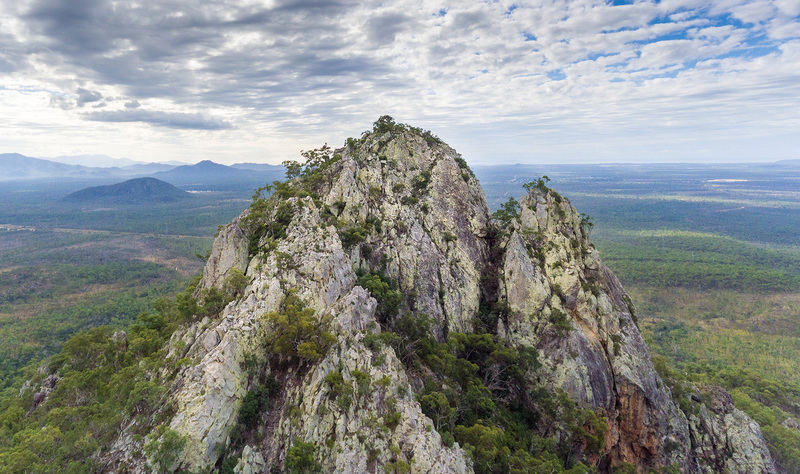 Despite the name, Frederick Peak also refers to a number of rocky pinnacles in the area and is commonly referred to as 'Freds Peak' or just plain 'Freds' to the regular rock climbers. It's often misspelt with an 's' suffix e.g. "Frederick's Peak" or "Fredericks Peak". The area is also known as "Pinnacles Mountain" to some. The walk in can be a bit of a mission if you don't have at least a four wheel-drive or a ute with high clearance, but it is worth it. Although there isn't any creeks or waterholes, the environment, and of course the hike, is spectacular. Frederick Peak offers a superb view of the entire city and unlike Mt Stuart, the area offers views from Townsville Dam to the coast at Northern Beaches. 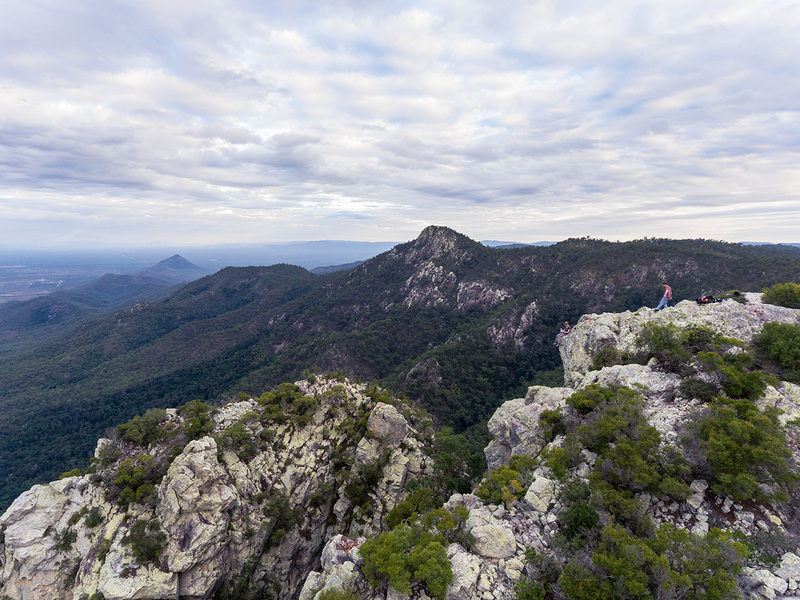 Four prominent pinnacles are situated on the Hervey Range end; which includes the North and South Sentinels, Frederick Peak and, off in the distance, the South Pinnacle. The surrounding arid environment is home to a large variety of wildlife. These Rhyolite peaks of Frederick Peak and South Pinnacle protrude above the surrounding plateaux. Geologically, they are possibly the only obvious examples in the region of what may have originally been part of deep underground volcanic vent passages from one of the very ancient mountain building periods that crafted almost all mountains and plains that are visible. The first two pinnacles are the most popular in the area for rock climbing due to the ease of access. The North Sentinel can be easily summited via the backside however summiting the South Sentinel is not an easy task and should not be attempted unless you a very experienced rock climber. It's a very exposed climb and is probably a grade 16. I highly discourage anyone from trying, even if you are a decent rock climber. The rock features in this area are very interesting and is probably a geologist's dream. The highlights would have to be the fish bowl, the archway and the chasm. To climb up through the chasm, you must be a decent climber and is not for beginners; you also should not be afraid of tight spaces to climb through the chasm. The must see would have to be the exceptional views from the Frederick Peak is easily access via the backside of the peak (see interactive map). If you are in this area, you should put this on your list to summit. Off in the distance is South Pinnacle and is hardly visited by humans. Rock climbers are generally not into hiking and offers the same view as Freds. It's an incredibly diverse mountain right in our suburbs. Open cliff ecosystems are each unique regionally and one is clearly unique to the world. This mountain has large patches of Semi-evergreen Rainforest almost in the suburbs through to Seasonally Very Dry Rainforests. Poplar Gum Woodland, Tall Bluegum Forest (related species) to Brush Box Shrubland and dwarfed open Cliff Ecosystems. The dominant eucalypts are the White Mahogany (Eucalyptus acmenoides), one of the Stringbarks, and the Pink Bloodwood (Corymbia intermedia). Both these trees are widespread species which can grow into much larger trees in the areas with more favourable soil and climatic conditions. Patches of Semi-deciduous Vine Thickets, a type of dry rainforest, are visible from the top of the peak (the darker green vegetation on the slope below the summit). You also pass through this forest as you ascend Frederick Peak; this is one of the areas where the Gimpie Gimpie (Stinging Tree) plant can be found. This area is also home to an endemic plant, especially the first pinnacle (North Sentinel) featuring the only place in the world where Dubouzetia saxatilis (Elaeocarpaceae, small shrub) can be found, perhaps some thousand steep cliff crevice loving plants. This is the only place in Australia for the Dubouzetia genus except for another cliff loving species that inhabits a few Northern Territory waterholes. The weather at Frederick Peak is similar to the rest of Townsville. The best time of year to do this trek is in winter. The winter months are from May to October and the summer months are from November to April. The wet season lies November to April, but rain mainly occurs January, February and March; and the dry season lies between May to October. There isn't any water up there for almost all of the year but if you're very lucky, there may be a little stream. After some long and heavy rain, there will be a trickle down a small creek bed between the South Sentinel and Frederick Peak. Summer is extremely hot, so carry plenty of water and I would recommend at least 3 litres of water per person per day in Winter. This is a winter hike and I would highly suggest not to do this hike in summer. Research online or book into a first aid course and learn what to do in different situations. You should also have installed the Australian Red Cross First Aid app on your phone which guides you through up-to-date first aid. Another useful app is the Emergency+ app which was developed by Australia's emergency services, government and industry partners. The app uses GPS functionality built into smartphones to help a Triple Zero (000) caller provide critical location details required to mobilise emergency services. The Australian sun is extremely harsh and there's not much shade from trees as protection. 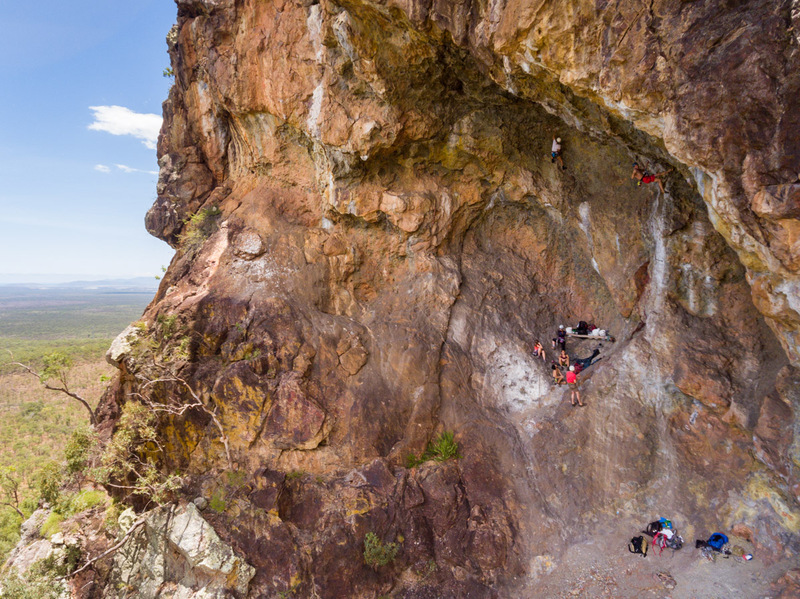 The rock climbing here is some of the best in Townsville! The rock is Intrusive Rhyolite and is well featured. The scenery is breathtaking and there's no better feeling that hanging of the side of these cliffs with a view like that. 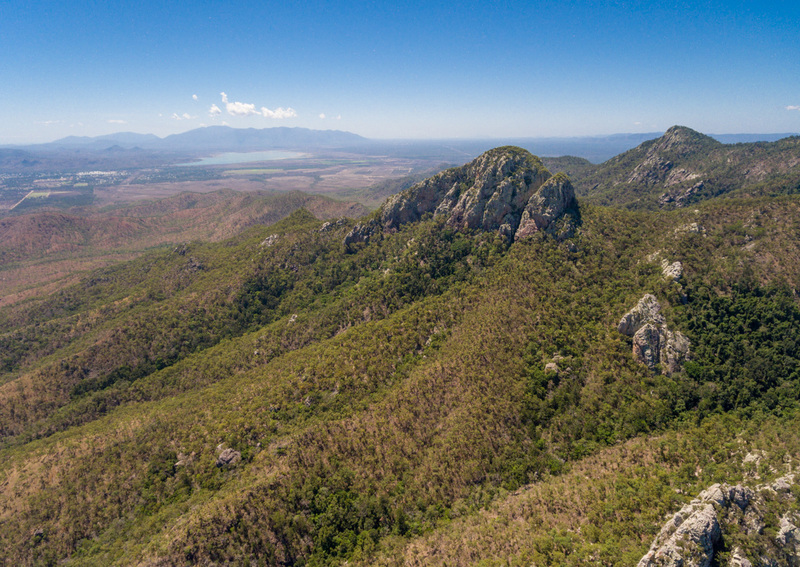 Due to its remoteness, and perhaps the relatively small climbing community in Townsville, it took quite some time before Frederick Peak really took off. If you're an inexperienced climber, try the more user-friendly crags such as Mt Stuart or some bouldering at Castle Hill or Hervey Marbles. If you are a avid and experienced climber, read the Frederick Peak Climbing Guide. Also see more information on The Crag. There are a few hazardous creatures you may encounter on this adventure. These include Rainforest Scorpion, Yellow Paper Wasp, Death Adder, and Queensland Tarantula. Also there's the Gimpie Gimpie (Stinging Tree) plant. But don't let this deter you, it is Australia after all. Remember to take a First Aid Kit (with compression bandages for snake bites). Also consider a PLB (Personal Locator Beacon) or an EPIRB (Emergency Position Indicating Radio Beacon). DO NOT THROW ROCKS OF THE CLIFFS AS ROCK CLIMBERS MAY BE BELOW! Don't leave breadcrumbs! Do not leave shields in trees, tape or paint behind you unless you are an experienced trail marker and have set out for that purpose. If you can navigate properly, you won't need to mark the trail as a 'just in case'. If you are, you're not only ruining it for others as they try to follow your poorly positioned markers, you're out of your depth and you shouldn't be there in the first place. If you feel this is you but would like to go, contact the Townsville Bushwalking Club, a similar group or an experienced friend. Please do not disturb the vegetation and follow the advice of the local rock climbers. They are very experienced in the area and come out here every weekend; it's pretty much their home... Stick to their trails as much as possible to reduce the human impact. 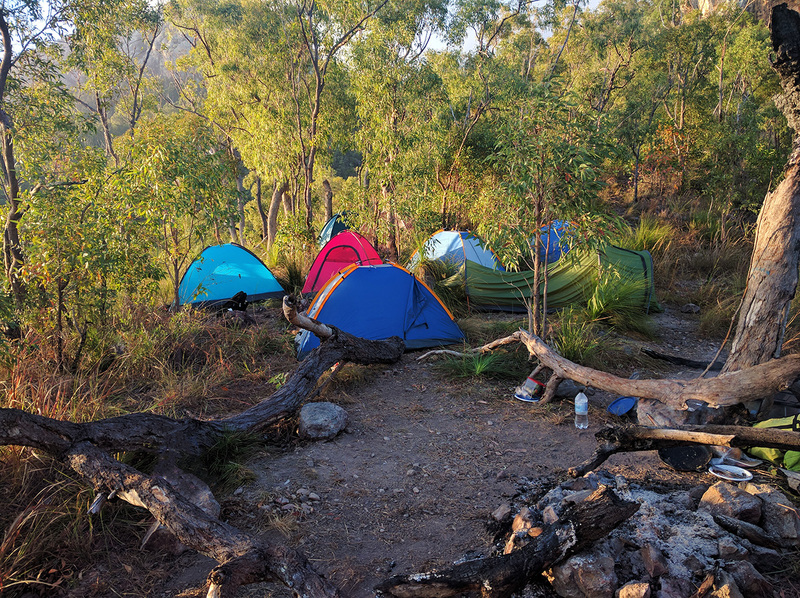 Do your business at least 100m away from trails, cliff and campsites. There's lots of hidden rocks under the long grass so you will need to be good on in your feet - especially when heading out to South Pinnacle. Guinea grass and Lantana cover sections of the hillsides which can make the walk unpleasant at times. 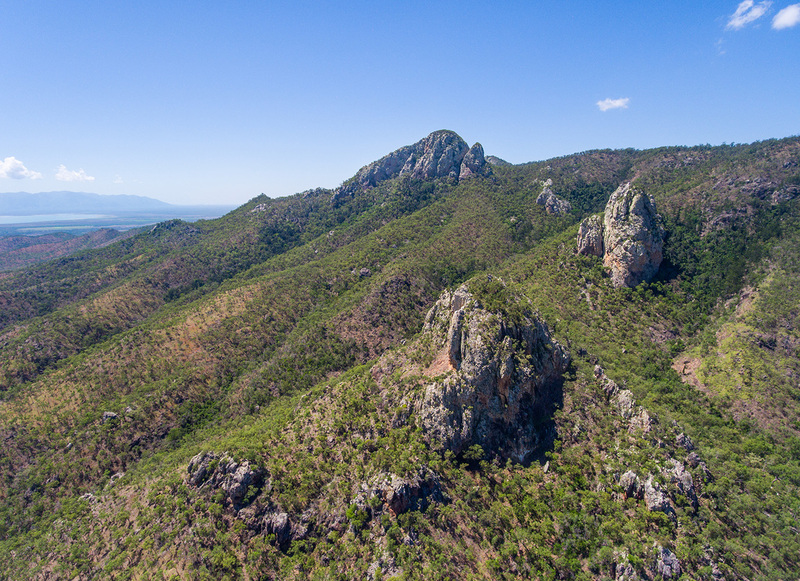 Frederick Peak is located just outside of Townsville and lies on USL (Unallocated State Land); a politically correct way of saying Crown Land. Queensland Parks and Wildlife Service (QPWS) have registered an interest in this area so it just may be turned into a National Park. 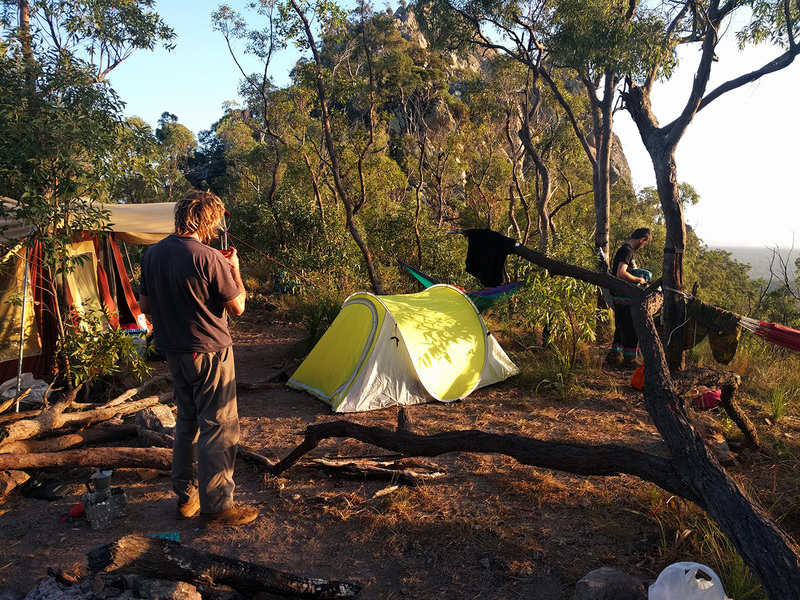 The walk-in is uphill, loose in sections, overgrown and difficult to follow at night; Over the last years being frequented by rock climbers, there is now a noticeable, rough path trampled up to the first campsite and the two pinnacles. Before you set off on your adventure, please beware that this is a remote area and that it's not a beginner's walk. There is no track and you will need to be able to navigate yourself through the bush. As usual, a code of conduct must be followed to maintain access to the area. You don't want there to be a reason why we are locked out of more places around Townsville (Forestry Road, Ollera Creek, Dalberg). Local delinquents have previously dumped garbage alongside the dirt access road and burned car carcases now litter the area. If you witness any illegal dumping report them to the Townsville Council on 1300 878 001. Taking note of the vehicle's registration number, make, model, time, date and location is required to help eradicate these pests. Access to the area has always been a sensitive issue as access requires passing through private property. A competent 4WD is necessary. Please do not wreck these track by going out when it has been raining and stick to the existing track. For these reasons, access instructions are not given in this article. 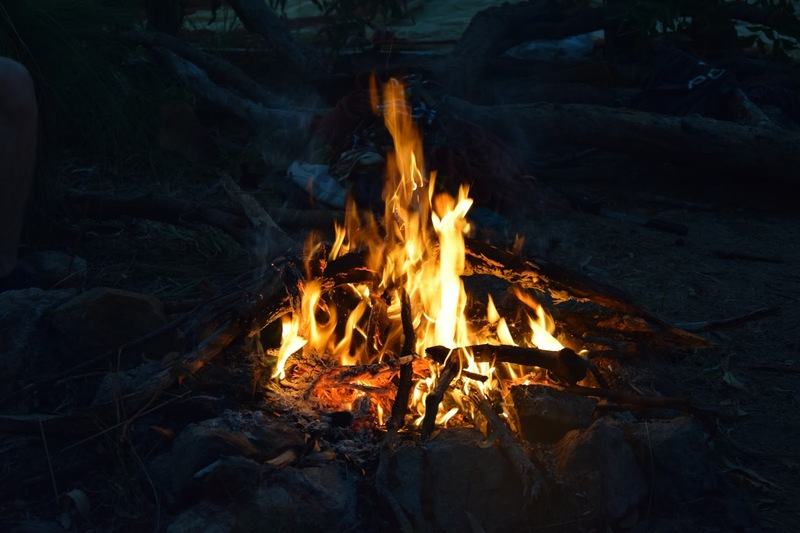 Camping is possible, although there are no amenities available obviously. 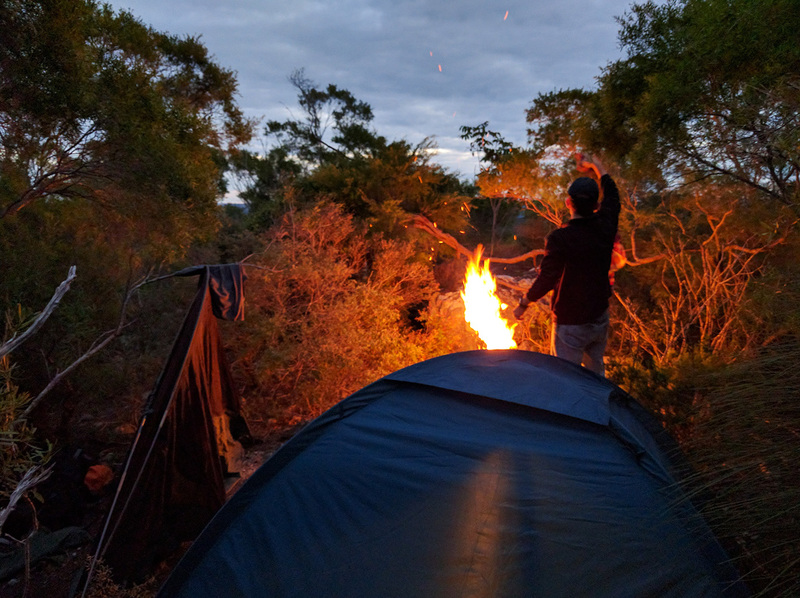 There is a large area situated on the ridgeline between the North and South Sentinels to set up camp; which provides a great view of Townsville and a cool breeze. There is also a very tiny dirt patch on top of Frederick Peak for two people to set up a small tent. It's a great place to watch the Townsville Show Day fireworks and to take in the city lights. Announcing that I would spend my semester abroad in Townsville at the James Cook University - a lot of my friends, especially the ones that had been to Townsville, looked at me questioning.